1Red de Ecología Funcional. Instituto de Ecología A.C.
2Laboratorio de Ficología. Instituto de Biología. Universidad Nacional Autónoma de México. 3Unidad Académica de Orizaba. Universidad Politécnica de Huatusco. Enzymes are considered the most proficient catalysts for industrial processes. Nowadays, a few bacterial or fungal enzymes dominate the enzymatic global market (e.g. cellulases, amylases, proteases); however, algae have interesting metabolic routes related to nitrogen, phosphorous and carbon biogeochemical cycles, which could serve as enzyme sources with industrial, biomonitoring and bioremediation applications. Algae are a polyphyletic group of organisms that live in different, and some cases extreme, environments. These characteristics and their metabolic adaptations, make them ideal sources for novel enzymes. The aim of this review was to summarize the available knowledge in the field of algae-based enzymes production, which have potential uses in different fields, ranging from human health applications, carbon sequestration, mining effluents treatments and water bodies monitoring, among others. In addition, seven enzymatic algal complexes are described: carbonic anhydrase, hydrogenase, lipoxygenase, nitrilase, nitrogenase, phosphatase, and thiolase; also, we propose to consider the algal-derived enzymes in the list of added value byproducts of these organisms, mainly when harnessed under a biorefinery scheme. Las enzimas se consideran los catalizadores más adecuados para los procesos industriales. Hoy en día, unas pocas enzimas bacterianas o fúngicas dominan el mercado enzimático global (e.g. celulasas, amilasas, proteasas); sin embargo, las algas tienen interesantes rutas metabólicas relacionadas con los ciclos biogeoquímicos de nitrógeno, fósforo y carbono, que podrían servir como fuentes de enzimas con aplicaciones industriales, de biomonitoreo y biorremediación. Las algas son un grupo polifilético de organismos que viven en ambientes diferentes, y en algunos casos extremos. Estas características y sus adaptaciones metabólicas las convierten en fuentes ideales de nuevas enzimas. El objetivo de esta revisión fue resumir los conocimientos disponibles en el campo de la producción de enzimas basadas en algas, las cuales tienen usos potenciales en diferentes campos, desde aplicaciones de salud humana, secuestro de carbono, tratamientos de efluentes mineros y monitoreo de cuerpos de agua, entre otros. Además se describen siete complejos enzimáticos de algas: anhidrasa carbónica, hidrogenasa, lipoxigenasa, nitrilasa, nitrogenasa, fosfatasa y tiolasa. Se propone también considerar las enzimas derivadas de algas en la lista de subproductos de valor agregado de estos organismos, principalmente cuando se aprovechan bajo un esquema de bio-refinería. Algae are a polyphyletic group of organisms which exhibit a wide diversity of forms and sizes (Hoek et al. 1995). They inhabit in countless environmental conditions, like fresh, salt and marine waters and in the surface of moist soil or rocks (Singh & Singh 2015). There are many algae groups, and it is estimated that exist 72 500 species (De Clerk et al. 2013), many of them can express high metabolic growth and high biomass production, when suitable environmental conditions are fit: high luminosity, enough CO2 concentration, and nutriments availability (Graham et al. 2009; Singh & Singh 2014). This characteristic has been exploited to produce biomass-derivate products, like biodiesel (Speranza et al. 2015), bioethanol (Fasahati et al. 2015), biohydrogen (Bedoya et al. 2008) and biogas (Dębowski et al. 2013). Although algae are more productive per area of cultivation compared to first-generation biofuel feedstocks, its production may not be economically sustainable without high-value coproducts (Rothlisberger-Lewis et al. 2016). Many authors support that, to increase the industrial processes sustainability, biomass needs to be harnessed properly, under a biorefinery scheme (Cheali et al. 2015). In addition to serve as energetic feedstocks, many non-energetic byproducts can be obtained from algae (Trivedi et al. 2015) as phycocolloids (Zajic 1970) and pigments (Muñoz-Crego & López-Cruz 1992), many of them are known to have applications in cosmetic, pharmaceutical and food industries (Hallmann 2007). Of the added-value products from biomass, enzymes highlights. Actually, different kinds of enzymes are required in many industrial processes, because enzymes are the most proficient catalysts, offering much more competitive processes compared to chemical catalysts (Choi et al. 2015). Nowadays, microbial and fungi enzymes are utilized at large scale in food industry (i.e. amylase, protease, lipase, gluco-oxidase, pectinase and tannase), due to their high specificity and least by-products (Saxena et al. 2001). Despite the global enzyme market is dominated by few microbial enzymes, the potential of utilizing novel enzymes as biocatalysts for many processes is unmeasurable. As is stated above, algae are important biomass factories which can growth in many environments, and have enzymes mediated metabolisms, that turns them into good candidates for industrial enzymes production (Table 1). Thus, this review aimed to summarize the “state of the art” of some algae-based enzymes production, focused in the enzymes with industrial or environmental applications. Algae, like any other organism, regulate their metabolism according to different environmental changes. This metabolic modification affects the type and the amount of the enzymes produced, and in turn, changes in the enzymatic pool modify the metabolic pathways, leading to the accumulation or depletion of different cell compounds. Understanding the metabolic response of algae to variation in the environmental factors, is crucial to produce any metabolite. Variations in nutrient availability (e.g. nitrogen, phosphorous, sulfur), pH, salinity, light quality, temperature, and the presence of xenobiotics have been associated with changes in the metabolism of algae, which modifies their enzymatic production. In this way when light quality or CO2 concentration changes, we observe variations in enzymes related to photosynthesis. For example, when Chlamydomonas reinhardtii Dangeardis exposed to low CO2 concentrations, the pyrenoid structures development starts, and with it, the accumulation of high amounts of 1,5 biphosphate carboxylase/oxygenase (Kuchitsu et al. 1991) for CO2 fixation. Light quality affects the algal fitness as well; it is known that blue light (LED) is a better stimulus than white light for the production of biomass and lipids in Chlorella vulgaris Beijerinck (Atta et al. 2013), and an excess of luminous energy causes the production of protective proteins, like the antenna complex LHCSR (in C. reinhardtii; Peers et al. 2009). Protective proteins balance the light absorption capacity from photosystem II and photosystem I, acting by the mediation of thylakoid-associated Ser-Thr kinase Stt7 (Bellafiore et al. 2005). Understanding the regulation of the photosynthetic enzymes in algae, is very important not only for biomass development, but also because these enzymes (fructose 1,6 bisphosphatase, NADP glyceraldehyde 3 phosphate dehydrogenase, and ribulose 5 phosphate kinase) from Euglena, Chlamydomonas, Synechococcus and Synechocystis,have insusceptibility to H2O2 and hydroxylamine (Takeda et al. 1995), which could have biotechnological applications, contrary with enzymes from other sources (Kaiser 1976). Nutrient availability/starvation is other of the main factors that drive changes in the enzymatic-algal pool. It is known that nitrogen and phosphorous starvation lead the lipid accumulation; the same effect is observed in conditions of high salinity. Even when this is important to produce lipids for biodiesel, the phosphorous starvation can negatively affect the production of enzymes. In algae, enzymes are produced by phosphorous–rich ribosomes (Ågren 2004); thus, phosphate limitation have a severe impact on enzyme production (Courchesne et al. 2009). On the other hand, nitrogen starvation can cause the induction of some proteases (Berges &Falkowski 1998), and the induction of nitrogenases (with or without heterocyst) for N fixation and hydrogen production, in the genus Anabaena (Masukawa et al. 2014). Proteases production is related to self-protein digestion to serve as carbon/energy supplies for triacylglycerols anabolism; in addition, genes codifying for diacylglycerol:acyl CoA acyltranferases increase their transcript abundance under nitrogen depletion (Msanne et al. 2012). Sulfur is other important nutriment for algae. The metabolism of sulfur in algae, mainly marine phytoplankton, is highly important because the major input of dimethylsulfide (DMS) into the atmosphere is mediated in a great manner by phytoplankton (Simó 2001); this process involves the action of several enzymes, like ATP sulphurylase and APS sulphotransferase (Stefels 2000). In chlorophytes, when sulfur deprivation and anoxic conditions are fit, algae switch their metabolism towards fermentation. Under these conditions, [Fe]-hydrogenases are synthetized to serve as energy donors for anaerobic metabolism (Winkler et al. 2002). Some algal enzymes are activated for the metabolism of xenobiotics. Algae can endure and degrade some herbicides, as metflurazon, thanks to the enzyme cytochrome P450 monooxygenase, which exhibit a N demethylase activity in Chlorella (Thies et al. 1996). Other herbicides like atrazine, glufosinate, glyphosate, oxyfluorfen and diuron, also induce the production of antioxidant enzymes, like superoxide dismutase, peroxidase and catalase in Chlorella (Romero et al. 2011); and ascorbate peroxidase, glutathione reductase, and glutathione S transferase in Scenedesmus (Geoffroy et al. 2002). These antioxidant enzymes limit lipid peroxidation, DNA damage, and protein degradation. Heavy metals also induce the production of antioxidant enzymes in microalgae (Arunakumara & Xuecheng 2008). Thus, many algal enzymes, which could have different biotechnological uses, respond to specific environmental or anthropogenic stimulus. The knowledge of these different responses in enzyme production is very important, when the aim is to co-produce an algal enzyme in a biorefinery. Even if the production potential of many algae derived products is very high, culture and processing technologies are required to be optimized, to make large-scale production profitable (Gimpel et al. 2015). It is estimated that only the 20 – 40 % of the algal biomass can be utilized to produce biofuels; and the remaining 60 – 80 % contains high value coproducts, like organic pigments, nutraceuticals, omega-3 fatty acids, enzymes, algal meal, among others (Subhadra & Edwards 2011). This offers the possibility of produce, from algal biomass, high quantities of biofuels to low cost and low quantities of coproducts of high value. The product extraction steps, in a biorefinery that uses algal biomass, depends of the number of coproducts that are intended to obtain. Each step involves an additional cost, that is why the design of the biorefinery and the market analysis is of great importance when the aim is to go further than a pilot scale. In order to assess the environmental impact of the algal biorefinery, the water, land and carbon footprints should be measured too. Life cycle models, and fuzzy linear programing have been successfully used for this propose (Ubando et al. 2012). Generally, the first extraction step is for the main product of the biorefinery. This one could be fatty acids or starch, when the aim is to produce biodiesel or bioethanol. Several methods have been described for the extraction of lipids and starch; however, not all are suitable for a subsequent enzyme recuperation. For example, the hydrothermal liquefaction process allows the production of high amounts of algae-oil, but the process involves high temperatures (250 °C to 350 °C) and pressure (1500 to 3000 psi), which denature all the enzymes; also, it consumes a fraction of the nutrients (e.g. nitrogen) of the biomass, avoiding its recycling (Frank et al. 2013). Other methods involve the use of organic solvents (e.g. ethanol, chloroform, hexane; Ramluckan et al. 2014), but have many drawbacks related with energy consumption. Recently, it has been proposed the use of switchable solvents (N, N-dimethylcyclohexyl-amine) to extract lipids directly from liquid cultures of algae (Samori et al. 2012), showing promising results; although, it must be account the toxicity of N, N-dimethylcyclohexyl-amine. Thus, alternative solvents like α-pinene, d-limonene and p-cymene are under consideration, (Dejoye et al. 2013). For starch recuperation, similar methods using organic solvents, acid pretreatments or even genetic modified yeast are used for bioethanol production (Aikawa et al. 2013; Scholtz et al. 2013); but no matter which method is used, it is important planning the utilization of the residual biomass. When the aim is to isolate enzymes, can be used the following methods of extraction. Generally, crude enzymes are extracted using buffers, which protect them from denaturation and preserve its activity; for algal enzymes, the buffer of Davison (1987) and Davison & Davison (1987) has been successfully used for the isolation of photosynthetic enzymes and kinase of brown algae. For green microalgae, the buffer of Gerard & Driscoll (1996), is suitable for isolation of ribulose 1,5 bisphosphate carboxylase oxygenase (Bischof et al. 2002). For lipoxygenase extraction from cyanobacteria cells, the use of phosphate buffer (pH 7) enriched with nonionic detergents (e.g. Brij 99 0.1 %) is appropriate (Beneytout et al. 1989). Extrusion with French pressure disrupt the unicellular algae cells without denaturing enzymes; this method has been used for the isolation of acetyl-CoA synthetase, acetate kinase, phosphotransacetylase, citrate synthase, isocitrate dehydrogenase, isocytrate lyase, urease, urea amidolyase, malate synthase, NADP linked glyceraldehyde 3 P dehydrogenase, ribulose 5 P kinase, NADP linked malic dehydrogenase, sedoheptulose l,7 diphosphatase, fructose l,6 diphosphate, glucose 6 P dehydrogenase and P fructokinase (Duggan & Anderson 1975; Leftley & Syrett 1973; Pearce & Carr 1967). Ultrasonic disruption can break down the algal cells, and did not affect enzyme activities; this method was used for the isolation of isocitric acid dehydrogenase, malic acid dehydrogenase, α-ketoglutaric acid dehydrogenase and succinic acid dehydrogenase from blue-green algae (Smith et al. 1967). Other methods, like immunoprecipitation can be used for enzyme isolation. Superoxide dismutase from blue-green algae was extracted with antibodies, and precipitate with ammonium sulfate at 33 % (Asada et al. 1975). The methods of cell disruption for enzyme isolation, are also useful for lipid or starch extraction, thus can be successfully incorporated in a biorefinery design. Genetic engineering seeks to improve the production of enzymes or metabolites. A variety of transformation methods have been used to transfer DNA into microalgal cells: including agitation in the presence of glass beds or silicon carbide whiskers, electroporation, biolistic microparticle bombardment (the prefer one for chloroplast transformation; Purton et al. 2013), and Agrobacterium tumefaciens-mediated genetic transfer (Radakovits et al. 2010). Algae can be transformed in nuclear, as well as in chloroplast genomes. Some algal genes, which codifies for enzymes, have been object of genetic manipulation seeking for the overexpression of the enzyme. The acetyl Co-A carboxylase, involved in fatty acids production, was successfully overexpressed in Cyclotella cryptica Reimann, Lewin & Guillard (Dunahay et al. 1995). Also, some enzymes related to β-oxidation of fatty acids can be inhibited, with the aim of accumulate lipids (Michinaka et al. 2003), however little is known about this in algae. Transgenic microalgae can be used to produce specific fatty acids. Ideal fatty acids for biodiesel production should be 12:0 and 14:0; the chain lengths of fatty acids are determined by acyl-ACP thioesterases; transgenic or overexpression of these enzymes into algae, could modify its fatty acids production (Radakovits et al. 2010). Other important enzyme, which should be object of manipulation, is ADP-glucose phosphorylase (AGPase); this enzyme is key in the process of starch production, and have been successfully overexpressed in plants (Zabawinski et al. 2001). The transgenic methodologies for algae manipulation, are well developed for several models, like Chlamydomonas reinhardtii, Volvox carteri Stein, Phaeodactylum tricornutum Bohlin, Dunaliella salina (Dunal) Teodoresco and Haematococcus pluvialis Flotow (Walker et al. 2005). Also, the DNA genomes of algal viruses (e.g. phaeovirus Es V-1; Delaroque et al. 2001) represent a source of strong promoters that potentially could be exploited to produce heterologous proteins (or enzymes) in algal cells (Walker et al. 2005). The metabolic pathways engineer in algae, seeking the accumulation of lipids or starch is very complex, and involves the overexpression or inhibition of many enzymes. Beer et al. (2009) indicate that, when the aim is to increase lipid production, at least five steps should be achieved which involves the overexpression of enzymes related to fatty acids production, inhibition of the enzymes of the β-oxidation and lipid hydrolysis pathways, regulation of the activity of the desaturases, and control of the fatty acids length by thioesterases. The transcription factor engineering of target enzymes, which lead to overexpression, is a very promising strategy since it may avoid the limitations of other commonly used approaches, like biochemical stress or even genetic engineering; however, it is still a novel concept to be investigated systemically (Courchesne et al. 2009). Classical promoters used for heterologous expression of proteins in algae are those of photosystem I complex protein, HSP70A or RBCS2 (Fisher & Rochaix 2001; Schroda et al. 2000). In addition, bacterial or viral promoters are other tool for heterologous protein expression in algae. Some heterologous enzymes expressed are: neomycin phosphotransferase and nitrate reductase using the nopaline synthase promoter of Agrobacterium tumefaciens (Hall et al. 1993); chloramphenicol acetyl transferase using the cauliflower mosaic virus 35S promoter (CaMV 35S; Tang et al. 1995), β-glucuronidase and hygromycin phosphotransferase with the same promoter (Kumar et al. 2004) and aminoglycoside 3’-phosphotransferase using CaMV 35S (Díaz-Santos et al. 2013). In summary, the overexpression of certain enzyme genes, could be very helpful for metabolic engineering in algae, for bioactive compounds production, or to serve as biofuels prime matter. Carbonic anhydrases (CAs) are ubiquitous metalloenzymes (with Zn2+ active site) found in prokaryotes and eukaryotes in different isoforms: the α-CAs (present in vertebrates, eubacteria, algae and cytoplasm of green plants); β-CAs (predominantly in eubacteria, algae and chloroplasts of both mono as well as dicotyledons), γ-CAs (mainly in archaea and some eubacteria) and δ- and ζ-CAs (both discovered in marine diatoms). These enzymes have an important role in several different metabolic processes such as acid–base regulation, respiration and transportation of carbon dioxide and bicarbonate (Chegwidden et al. 2000). In recent years, there has been an increasing interest in the utilization of these enzymes in CO2 caption and storage processes (Di Fiore et al. 2015); since it is possible to convert the captured CO2 into various benefic by-products through enzymatic catalysis, among them acrylates, polycarbonates, stable carbonate storage polymers, methane and building materials (Beckman 1999). To improve the process of sequestration, some biological methodologies, also called “bio-mimetic” CO2 capture systems have been implemented as economic and sustainable technologies (Di Fiore et al. 2015). As previously described, all CAs in vertebrates belong to α-CAs. These enzymes have been found in a periplasmic location of Chlamydomonas reindhardtii (Fukuzawa et al. 1990). This alga has proved to present homologous sequences with human isozymes, particularly CA I, CA II and CA III (Fukuzawa et al. 1990). Among α-CAs enzymes, CA-II is the most studied form of CA isozyme because of its functions and uses in human health. CA II was successfully used as liver protector, and to improve the preservation of transferred organs, because it regulates pH changes caused by cold ischemia (Bejaoui et al. 2015). Given the homology between algal and human α-CAs, and its uses in medicine, algal biomass could be used as an alternative source of these enzymes. Thus, CAs are promising enzymes used for CO2 sequestration and transferred organs protection. Even though they are mostly isolated from vertebrates, human erythrocytes and other animals, algae also share some isotypes like CA I, CA II and CA III (Fukuzawa et al. 1990). More studies are required to explore the isotypes present in other algae species; since several need to fix carbon from environment, many isotypes might still be ignored. The study of this enzyme might offer a new byproduct to biorefinery initiatives and environmental benefits in the frame of climate change. Hydrogenases (H2ases) are enzymes that catalyze the reversible oxygenation of molecular hydrogen. They play a central role in microbial metabolism and are important enzymes in the photobiological H2 production (Vignais et al. 2001). There are three classes of hydrogenases: the [Fe]-H2ases, [NiFe]-H2ases and the metal-free H2ases, according to the catalytic nucleus of the enzyme (Gutekunst et al. 2006). These enzymes are proposed to be used for hydrogen production. Biological H2 production offers distinctive advantages for environmental protection over existing physico-chemical methods. The hydrogen production by bio-photolysis, involves the conversion of water and sun energy into hydrogen and oxygen. This process utilizes microorganisms, generally microalgae and/or cyanobacteria, from photosynthetic reactions (Dutta et al. 2005; Gutekunst et al. 2006). The production of hydrogen by microalgae is based on the consequent transfer of electrons due to activation of photo-system 1 (PS1); the electrons flow to ferredoxin and after to the hydrogenase, all the process occurs in thylakoid-like structures (Martín-Gil & Martín-Gil 2004). The ferredoxin serves as an electron donor to [Fe]-H2ase in the electron Fe/chain of the green algae chloroplast (Contreras et al. 2008). It is known that some algae are hydrogen producers. 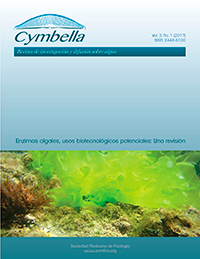 The main algal model in bio hydrogen production research are Chlamydomonas, showing very satisfactory results (Martín-Gil & Martín-Gil 2004). Some species that are been object of research in the bio hydrogen photoproduction field are Spirulina sp. and Anabaena sp. (Dutta et al. 2005). In addition, Contreras et al. (2008) reported that Chlorella vulgaris, Chlamydomonas angusta (Dujardin) Diesing (as C. angustae) and C. reinhardtii have the capacity to produce hydrogen by photoproduction. Unfortunately, the production of biohydrogen from algae resulted in very low yields; thus, more research is needed to improve the process, if the goal is to reach commercial levels. Lipoxygenases (LOXs) are defined as enzymes that specifically catalyze dioxygenation of unsaturated fatty acids containing a 1, 4-cis, cis-pentadiene system and produce cis, trans-conjugated monohydroperoxides as primary products. These enzymes produce the oxylipins 13-hydroperoxy-9, 1 1-octadecadienoic acid (13-HPODE) and 9-hydroperoxy- 10, 12-octadecadienoic acid (9-HPODE) when linoleic acid is used as substrate (Beneytout et al. 1989). Many oxylipin pathway products are involved in defensive mechanisms, e.g. plant produce different jasmonates and volatile compounds (mainly from octadecanoids and hexadecanoids; Weber 2002) which activate defense mechanisms against insects and pathogens; also, the hydroxy derivatives of linoleic acid exhibit antifungal or antimicrobial properties (Blée 2002). LOXs enzymes are the initial and key enzymes in oxylipin pathway; however, even if these enzymes are present in different organisms, some studies suggest a polyphyletic origin (Chen et al. 2015), and some LOXs from algae exhibit interesting properties. The red alga Pyropia haitanensis (Chang & Zheng) Kikuchi & Miyata has a LOX with multiple catalytic sites, and based on the analysis of their different reaction products, Chen et al. (2015) found that this enzyme is a multifunctional enzyme with lipoxygenase, hydroperoxidase and dihydroxiperoxidase activities. Multifunctional LOXs are very scarce in nature, but marine algae probably contain 5R, 8R, 9S, 12S, and 15S lipoxygenases that act on eicosanoic (C20) polyunsaturated fatty acids, as well as ω3, ω6, ω9 and ω10 lipoxygenases that act on octadecanoids (C18) (Gerwick et al. 1999). Thus, the oxylipin metabolism in red algae and diatoms featured both, animal- (eicosanoid) and plant-like (octadecanoids) oxylipins, which are involved in immunity mechanisms (Bouarab et al. 2004). This dual metabolism in red algae, employs a high diversity of LOXs, making them a rich source of oxylipins; also, algae are considered the richest group of life forms in oxylipins diversity (Gerwick et al. 1999). Many algal LOXs are non-specific, and catalyze different polyunsaturated fatty acids, ranging from C18 to C22 in Pyropia haitanensis, e.g. γ-linoleic acid, arachidonic acid, eicosapentaenoic acid and docosahexaenoic acid, producing different oxylipins (Chen et al. 2015). In the same report, found 16 different products from 4 polyunsaturated acids using only one algal LOX (PhLOX2). This high diversity of products can be used in biotechnological applications. In the knowledge that oxylipins are involved in the defensive mechanisms of algae, like the protection against herbivorous amphipods in Dictyopteris sp. (Schnitzler et al. 2001), and the toxicity of diatoms-aldehydic oxylipins against bacteria, fungi and even invertebrates (Adolph et al. 2004), the use of algal LOXs for the production/induction of oxylipins opens a huge opportunity in the field of biocontrol. Nitrilases are versatile nitrile-metabolizing enzymes used as an alternative of nitrile hydrolysis instead of strong acids or base catalyst (Djambaski et al. 2009). Nitriles are cyanide-substituted carboxylic acids with general structure R-CN. These compounds are synthesized on a large scale and are used as solvents, in plastic industry, synthetic rubber and as a starting material for pharmaceuticals, herbicides and other industrially important chemicals (Gupta et al. 2010). In addition, most nitriles are highly toxic and their biochemical degradation has been considered as an efficient way for detoxification of industrially polluted waters and soils (Djambaski et al. 2009). In plants, nitrilases are involved in the process of cyanide detoxification, in the catabolism of cyanogenic glycosides and presumably in the catabolism of glucosinolates (Piotrowski 2008). Cyanide is a metabolic by-product in the biosynthesis of plant hormone ethylene, and nitrilases transform the intermediate detoxification product β-cyanoalanine into asparagine, aspartic acid and ammonia (Piotrowski 2008). Meanwhile, nitrilases were found in many algal species, and has been associated with the biosynthesis of indole-3 acetic acid from indole-3-acetonitrile (Kiseleva et al. 2012). Algal nitrilases have an active site with a cysteine residue, which acts as a nucleophile for substrate attack when its sulfhydryl group undergoes unprotonated (Zhang et al. 2014a). Few studies of cyanide detoxification using algae are available, but the results obtained are promising. It was found that Chlorella pyrenoidosa Chickhas the capacity to transform cyanide into β-cyanoalanine and γ-glutamyl-β-cyanoalanine, and use it as a carbon and nitrogen source (Gurbuz et al. 2004). Also, algae require less nutrients for growing than some bacteria and fungi, and some species like Scenedesmus obliquus (currently Tetradesmus obliquus (Turpin) Wynne) can detoxify until 400 mgL-1 of cyanide in 68 h (Gurbuz et al. 2004). Cyanide is commonly used in mining and it is present in high quantities in its wastewater, and the use of S. obliquus has been recommended as a viable process for gold mine effluents bio treatment (Gurbuz et al. 2009). Algae containing nitrilases, or free-nitrilases could be a good option for bioremediation processes, nevertheless, more research is needed in this field for enhance nitrilases production in algae. Free nitrilases from Pseudomonas fluorescens (Sohoni et al. 2015), and Acidovorax facilis (Zhang et al. 2014b), among other bacterial nitrilases have been successfully produced, but few studies have reported the production of algae-based nitrilases. Heterologous expression of nitrilases in bacteria could be a good strategy for the production in large-scale; however here is a lack in the knowledge of algae-nitrilases production. This enzyme is essential for atmospheric nitrogen fixation, being the cyanobacteria the main organisms that accomplish this important function in ecosystems (Fay 1992). Nitrogenase is an enzymatic complex, conformed by two components, the dinitrogenase (Mo-Fe protein), which is a tetramer α2β2 that have their subunits codified by nifD and nifK genes, and the dinitrogenase reductase (Fe protein) which is a dimer of two identical subunits, codified by nifH gene (Bergman et al. 1997; Fay 1992). The last one collects electrons from external donors (ferredoxin or flavodoxin) and transfers them, in an ATP dependent process, to dinitrogenase, that utilizes the reducing power to convert N2 into ammonium. The nitrogenase from cyanobacteria have similar characteristics to other N2 fixing bacteria nitrogenases. For example, Gloethece sp., Plectonema o Pseudanabaena which have the genes nifH, nifD and nifK, organized in a single operon, similar to some diazotrofic bacteria, such as Azotobacter or Rhizobium sp. (Soto-Urzúa & Baca 2001). Some cyanobacteria can differentiate specialized cell forms, in response to environmental signals (Soto-Urzúa & Baca 2001). For example, when nitrogen sources (NH4+, NO3-) are limited, some cells from thallus change into heterocytes (Whitton & Potts 2012). On the other hand, when nitrogen sources are available, the nitrogenase synthesis and heterocyte formation are repressed (Graham et al. 2009). The heterocytes are specialized structures for nitrogen fixation, inside them is generated an anaerobic environment suitable for N2 reduction by nitrogenase (Böhme 1998). However, some species of cyanobacteria have no heterocyst and utilize different mechanisms of protection against oxygen, to ensure the nitrogenase catalysis (Berman-Frank et al. 2003). These mechanisms can involve spatial and temporal separation of the photosynthetic, respiratory and N2 fixation processes (Berman-Frank et al. 2003). Some diazotrophic species, like those from the genus Anabaena and Nodularia present a clear spatial separation between N2 fixation (that occurs in heterocyst) and photosynthesis that occurs in the rest of the vegetative cells (Fay 1992). Temporal differentiation can occur controlling the expression of the photosynthetic and nitrogen fixation genes; thus, the first ones (psaA, psbA genes) are expressed with several hours of difference with respect to the genes nifHDK in a circadian rhythm (Bergman et al. 1997). Cyanobacterial nitrogen fixation has acquired great ecologic relevance in many natural and artificial ecosystems. For example, in rice fields it allows the input of 5 g of N per m2/year, and in shallow lakes from polar areas, where atmospheric nitrogen fixation is extremely important, it can ensure the input of 1.5 g per m2/year (Megías et al. 2011). In oceanic ecosystems, some cyanobacteria, like Trichodesmium sp. and Richelia intracellularis Schmidt (in association with diatoms) are some of the main nitrogen fixators, and the amount of nitrogen fixed is only comparable to the nitrate input (Bergman et al. 2012). At global scale, it is estimated that the oceanic nitrogen fixation is similar to the terrestrial fixation (100-200 Tg per year), and Trichodesmium can fix 60-80 Tg N annually. The great nitrogen fixation power of cyanobacteria could be very valuable for ecosystems and human activities, like rice production, where can incorporate 70-110 Kg×N×ha-1 per culture cycle (Megías et al. 2011). Phosphatases are a group of enzymes that release inorganic phosphorous from organic sources, making it available for plants, algae and fungi, among others. In marine algae, alkaline phosphatases are mainly produced, due to the pH of water (8.3); these phosphatases are not free-enzymes, they are localized in the external part of the alga (cell wall, external membrane or periplasmic space; Hernández et al. 1994). Alkaline phosphatase (AP) activity from the algal genus Gelidium, Cladophora, Polysiphonia and Stypocaulon can be useful for environmental monitoring because they are very sensitive to phosphorous availability (Hernández et al. 2002). AP of single algal cells, as Scenedesmus quadricauda (currently Desmodesmus communis (Hegewald) Hegewald) and Asterionella formosa Hassall, could be an indicator of the internal P status (Litchman & Nguyen 2008). Generally, when there is high P availability, phosphatase activity is low, and vice versa (Pettersson 1980); however, some authors pointed that the increase or decrease in phosphatase activity, depending to P concentration, may not be immediately, and could be related to other variables (Litchman & Nguyen 2008). Phosphatases can be helpful for water monitoring. AP activity of Chlorella vulgaris has been proposed as a biosensor for heavy metals (Cd2+ and Zn2+) contaminated water, which is important for constant monitoring of water bodies (Durrieu & Tran-Minh 2002). In the same way, Scenedesmus quadricauda and Anacystis nidulans (currently Aphanothece nidulans Richter) showed a decrease in their alkaline phosphatases when they were exposed to Ni2+, Zn2+ and Cd2+ (Awasthi 2012), and Arthrospira platensis Gomont when it was exposed to Cd2+ and Hg2+ (Tekaya et al. 2013). The sensitivity of AP to heavy metals contamination, and the possibility of using immobilized algal cells, opens the opportunity of easy and rapid detection of contamination by heavy metals in water bodies. Some algal phosphatases have important biological roles, which can be used for biotechnological applications. Mannitol is one of the principal reserve of carbohydrates in brown algae, and can represent up to 20-30 % of their dry weight (Reed et al. 1985); this polyol is synthetized in two enzymatic steps. First, fructose 6-phosphate is reduced into mannitol 1-phosphate by the mannitol 1-phosphate dehydrogenase, and subsequently the phosphate group is released from mannitol by the mannitol 1-phosphate phosphatase (Iwamoto & Shiraiwa 2005). Mannitol is a poly alcohol that serves as an osmoprotectant in algae (Dittami et al. 2011), and has many medical and industrial applications. It can be used as a neuroprotective compound for Parkinson treatment (Shaltiel-Karyo et al. 2013), and to control the raised intracranial pressure and renal protection in diverse surgeries (Shawkat et al. 2012). Groisillier et al. (2014) characterized the genes of mannitol phosphatases of Ectocarpus silicolosus (Dillwyn) Lyngbye(EsM1Pase 1 and EsM1Pase 2), and comparing it to previous data of mannitol phosphatases of the red algae Caloglossa continua (Okamura) King & Puttock and the green microalga Micromonas sp. They suggest that brown algal-sequences, and their orthologues, represent an additional family of phosphatases, with new substrate specificity within the haloacid dehydrogenase superfamily. Cloning these genes into bacteria for its heterologous expression is possible (Libertador et al. 1998); thus, specific algal phosphatases could be used for specific aims as, an alternative production way for mannitol from fructose. Therefore, algal phosphatases do not only have a great ecological importance, due to their relevance in aquatic phosphorous cycle, they also have been successfully used as phosphorous availability and heavy metal biosensors, which are important in the field of biomonitoring. Further applications of this algal enzyme could be their use for advanced aims, like the production of mannitol from fructose. Thiolases are wide-distributed enzymes that can be found in prokaryotic as well as eukaryotic organisms including algae (Kursula et al. 2002). This enzyme family can be further subdivided into catabolic and metabolic thiolases. Both can catalyze a Claisen type condensation of two acetyl-CoA molecules to generate acetoacetyl-CoA (Reiße et al. 2014). Hence, these enzymes are key in forming extended carbon skeletons from the universal metabolic precursor acetyl-CoA into others of biotechnological interest. Biosynthetic thiolases are utilizing only acetyl-CoA and acetoacetyl-CoA as substrates (Kursula et al. 2002). In contrast, catabolic thiolases display a varied substrate spectrum which includes larger substrates such as 3-ketodecanoyl-CoA (Staack et al. 1978), involved in the lipid metabolism. Thiolases are found in different algal organelles. In Mougeotia, thiolase and the acyl-CoA-oxidizing enzyme are located exclusively in the peroxisomes, meanwhile, in Bumilleriopsis all enzymes of the fatty-acid fl-oxidation pathway (included thiolases) are constituents only of the mitochondria (Winkler et al. 1988). In Euglena gracilis Klebs and Eremosphaera, thiolase and acyl-CoA-oxidizing enzymes were found both in the peroxisomes as well as in the mitochondria (Graves & Becker 1974; Winkler et al. 1988). There has been a growing interest in thiolases for the uses of their products, because they are key enzymes in the biosynthesis of several sterols (e.g. ergosterol), by the mevalonic acid pathway (Lopes et al., 2013). Ergosterol is the predominant sterol of fungi and algae (Miller et al. 2012), it is produced from acetyl CoA and has interest since it has shown to have a suppressive effect on cancer growth and tumors (Kobori et al. 2007). Some efforts have sought to improve thiolase activity to obtain higher ergosterol yields; nevertheless, Dequin et al. (1988) showed that high thiolase activity are not sufficient to obtain a high level of sterol in yeast. Acetoacetyl-CoA thiolase leads to inhibition when high amounts of ergosterol are available, increasing its activity (among 3 hydroxy 3 methylglutaryl-CoA synthase/reductase) at low ergosterol quantities (in Saccharomyces cerevisiae; Servouse and Karst 1986). Acetoacetyl-CoA thiolase, called thiolase II, regulates the production of isoprenoids via mevalonate (Soto et al. 2011); and is a key enzyme for carotenoids biosynthesis in Cyanophora, Galdieria, Cyanidium, Mesostigma and Euglena,among others; however, green algae have lost this metabolic pathway (Lohr et al. 2012). The metabolic engineering for isoprenoids in algae is attracting the attention, mainly for their uses in industry (Tippmann et al. 2013). The production of acetoacetyl-CoA by thiolase II and 3-ketothiolase, can be used to produce polyhydroxybutyrate, an important precursor of biodegradable plastics (Ojumu & Solomon 2004); and for the production of biobutanol (Reiße et al. 2014). Thus, thiolases from algae, are important since they are key enzymes in sterols and isoprenoids biosynthesis, and can be used in the fabrication of bioplastic and biofuels, under the strategy of enzymatic cascades. Algae can be considered an excellent prime matter for biorefinery and are high-biomass producers that can serve as bioenergetics. In addition, algae produce different bio compounds like pigments, toxins and enzymes that can be considered as high value byproducts. In this review, we summarized the knowledge of different algal enzymatic complexes, which exhibit interesting properties for industry, bio remediation and bio monitoring representing an opportunity for biotechnological development. Bioprospection of algal enzymes will open an avenue into new biocatalyst discovering, that can be produced in photoreactors from algae, or produced by heterologous expression in bacteria. The use of algae for enzyme production have the advantage that they can be grown without carbon or nitrogen sources, and can consume small quantities of toxic compounds or heavy metals. Despite the potential of algae as source of novel enzymes, there is a lack of knowledge on this field. However, some efforts have been made to procure the understanding of metabolic insights in algae and the enzymes involved on it. In the future, algal enzymes could be helpful in different industrial activities, and could serve for environmental protection. Adolph, S., S. Bach, M. Blondel, A. Cueff, M. Moreau, G. Pohnert, S.A. Poulet, T. Wichard & A. Zuccaro. 2004. Cytotoxicity of diatom-derived oxylipins in organisms belonging to different phyla. Journal of Experimental Biology 207: 2935-2946. Ågren, G.I. 2004. The C : N : P stoichiometry of autotrophs – theory and observations. Ecology Letters 7: 185-191. Aikawa, S., A. Joseph, R. Yamada, Y. Izumi, T. Yamagishi, F. Matsuda, H. Kawai, J. Chang, T. Hasunuma & A. Kondo. 2013. Direct conversion of Spirulina to ethanol without pretreatment or enzymatic hydrolysis processes. Energy & Environmental Science 6: 1844-1849. Arunakumara, K.K.I.U. & Z. Xuecheng. 2008. Heavy metal bioaccumulation and toxicity with special reference to microalgae. Journal of Ocean University of China 7: 60-64. Asada, K., K. Yoshikawa, M-A. Takahashi, Y. Maeda, & K. Enmanji. 1975. Superoxide dismutase from a blue-green alga Plectonema boryanum. Journal of Biological Chemistry 250: 2801-2807. Atta, M., A. Idris, A. Bukhari & S. Wahidin. 2013. Intensity of blue LED light: A potential stimulus for biomass and lipid content in fresh water microalgae Chlorella vulgaris. Bioresource Technology 148: 373-378. Awasthi, M. 2012. Relevance of alkaline phosphatase activity of immobilized green algae and cyanobacteria for heavy metals toxicity monitoring. Journal of Materials and Environmental Science 3: 446-451. Beckman, E.J. 1999. Making polymers from carbon dioxide. Science 283: 946-947. Bedoya, A., J.C. Castrillon, J.E. Ramírez, J.E. Vázquez & M. Arias. 2008. Producción biológica de hidrógeno: una aproximación al estado del arte. Dyna 75: 137-157. Beer, L.L., E.S. Boyd, J.W. Peters & M.C. Posewitz. 2009. Engineering algae for biohydrogen and biofuel production. Current Opinion in Biotechnology 20: 264-271. Bejaoui, M., E. Pantazi, E. Folch-Puy, P.M. Baptista, A. García-Gil, R. Adam & J. Roselló-Catafau. 2015. Emerging concepts in liver graft preservation. World Journal of Gastroenterology 21: 396-407. Bellafiore, S., F. Barneche, G. Peltier & J.-D. Rochaix. 2005. State transitions and light adaptations require chloroplast thylakoid protein kinase STN7. Nature 433: 892-895. Beneytout, J., R. Andrianarison, Z. Rakotoarisoa & M. Tixier. 1989. Properties of a lipoxygenase in green algae (Oscillatoria sp.). Plant Physiology 91: 367-372. Berges, J.A. & P.G. Falkowski. 1998. Physiological stress and cell death in marine phytoplankton: Induction of proteases in response to nitrogen of light limitation. Limnology and Oceanography 43: 129-135. Bergman, B., J.R. Gallon, A.N. Rai & L.J. Stal. 1997. N2 fixation by non-heterocystous cyanobacteria. FEMS Microbiology reviews 19:139-185. Bergman, B., G. Sandh, S. Lin, J. Larsson & E.J. Carpenter. 2012. Trichodesmium – a widespread marine cyanobacterium with unusual nitrogen fixation properties. FEMS Microbiology reviews 37: 286-302. Berman-Frank, I., P. Lundgren & P. Falkowski. 2003. Nitrogen fixation and photosynthetic oxygen evolution in cyanobacteria. Research in Microbiology. 154: 157-164. Bischof, K., G. Kräbs, C. Wiencke & D. Hanelt. 2002. Solar ultraviolet radiation affects the activity of ribulose-1,5-biphosphate carboxylase-oxygenase and the composition of photosynthetic and xanthophyll cycle pigments in the intertidal green alga Ulva lactuca L. Planta 215: 502-509. Blée, E. 2002. Impact of phyto-oxylipins in plant defense. Trends in Plant Science 7: 315-321. Böhme H. 1998. Regulation of nitrogen fixation in heterocyst-forming cyanobacteria. Trens in Plant Science 9: 346-351. Bouarab, K., F. Adas, E. Gaquerel, B. Kloareg, J. Salaün & P. Potin. 2004. The innate immunity of a marine red alga involves oxylipins from both the eicosanoid and octadecanoid pathways. Plant Physiology 135: 1838-1848. Cheali, P., A. Vivion, K.V Gernaey & G. Sin. 2015. Optimal design of algae biorefinery processing networks for the production of protein, ethanol and biodiesel. Computer Aided Chemical Engineering 37: 1151-1156. Chegwidden, W.R., S.J. Dodgson & I.M. Spencer. 2000. The roles of carbonic anhydrase in metabolism, cell growth and cancer in animals In: W.R Chegwidden, N.D. Carter & Y.H Edwards. Eds. The carbonic anhydrases: New Horizons. Birkhauser Verlag Basel, pp. 343-363. Chen, H., Z. Zhu, J. Chen, R. Yang, Q. Luo, J. Xu, H. Shan & X. Yan. 2015. A multifunctional lipoxygenase from Pyropia haitanensis – The cloned and functioned complex eukaryotic algae oxylipin pathway enzyme. Algal Research 12: 316-327. Choi, J.-M., S.-S. Han & J.-S. Kim. 2015. Industrial applications of enzyme biocatalysis: Current status and future aspects. Biotechnology Advances 33: 1443-1454. Contreras, J.B., J.A. Scott, C.L. Mendoza, G. Espinal & Z. Zapata. 2008. Potencial de las algas verdes para la producción fotobiólogica de hidrógeno. Ciencia y Sociedad 33: 307-326. Courchesne, N.M.D., A. Parisien, B. Wang & C.Q. Lan. 2009. Enhancement of lipid production using biochemical, genetic and transcription factor engineering approaches. Journal of Biotechnology 141: 31-41. Davison, I.R. 1987. Partial purification and preliminary characterization of pyruvate kinase from the brown algae Ascophyllum nodosum. British Phycological Journal 22: 401-409. Davison, I.R. & J.O. Davison. 1987. The effect of growth temperature on enzyme activities in the brown algae Laminaria saccharina. British Phycological Journal 22: 77-87. Dębowski, M., M. Zieliński, A. Grala & M. Dudek. 2013. Algae biomass as an alternative substrate in biogas production technologies – Review. Renewable Sustainable Energy Reviews 27: 596-604. De Clerk O., M. Guiry, F. Leliaert, Y. Samyn & H. Verbruggen. 2013. Algal Taxonomy: A road to nowhere? Journal of Phycology 49: 215-225. Dejoye, C., M.A. Vian & F. Chemat. 2013. New procedure for extraction of algal lipids from wet biomass: A green clean and scalable process. Bioresource Technology 134: 271-275. Delaroque, N., D.G. Muller, G. Bothe, T. Pohl, R. Knippers & W. Boland. 2001. The complete DNA sequence of the Ectocarpus siliculosus virus EsV-1 genome. Virology 287:112–32. Dequin, S., F. Boutelet, M. Servouse & F. Karst. 1988. Effect of acetoacetyl CoA thiolase on sterol synthesis in the yeast S. cerevisiae and S. uvarum. Biotechnology Letters 10: 457-462. Díaz-Santos, E., M. de la Vega, M. Vila, J. Vigara & R. León. 2013. Efficiency of different heterologous promoters in the unicellular microalga Chlamydomonas reinhardtii. Biotechnology Progress 29: 319-328. Di Fiore, A., V. Alterio, S.M. Montia, G. De Simone & K. D’ambrosio. 2015. Thermostable carbonic anhydrases in biotechnological Applications. International Journal of Molecular Sciences 16: 15456-15480. Dittami, S.M., A. Gravot, D. Renault, S. Goulitquer, A. Eggert, A. Bochereau, C. Boyen & C. Tonon. 2011. Integrative analysis of metabolite and transcript abundance during the short – term response to saline and oxidative stress in the brown alga Ectocarpus silicolosus. Plant Cell and Environment 34(4): 629-642. Djambaski, P., P. Aleksieva, E. Emanuilova, G. Chernev, D. Spasova, L. Nacheva, L. Kabaivanova, I.M. Miranda & B. Samuneva. 2009. Sol-gel nanomaterials with algal heteropolysaccharide for immobilization of microbial cells, producing A-galactosidase and nitrilase. Biotechnology and Biotechnological Equipment 23: 1270-1274. Duggan, J.X. & L.E. Anderson. 1975. Light-regulation of enzyme activity in Anacystis nidulans (Richt.). Planta (Berlin) 122: 293-297. Dunahay, T.G., E.E. Jarvis & P.G. Roessler. 1995. Genetic transformation of the diatoms Cyclotella cryptica and Navicula saprophila. Journal of Phycology 31: 1004-1011. Durrieu, C. & C. Tran-Minh. 2002. Optical algal biosensor using alkaline phosphatase for determination of heavy metals. Ecotoxicology and Environmental Safety 51: 206-209. Dutta, D., D. De, S. Chauduri & S. Bhattacharya. 2005. Hydrogen production by Cyanobacteria – Review. Microbial Cell Factories 4: 36. Fasahati, P., H.C Woo & J.J. Liu. 2015. Industrial-scale bioethanol production from brown algae: Effects of pretreatment processes on plant economics. Applied Energy 139: 175-187. Fay, P. 1992. Oxygen relations of nitrogen fixation in Cyanobacteria. Microbiological Reviews 56: 340-373. Fisher, N. & J.D. Rochaix. 2001. The flanking regions of PsaD drive efficient gene expression in the nucleus of the green alga Chlamydomonas reinhardtii. Molecular Genetics and Genomics 265: 888-894. Frank, E.D., A. Elgowainy, J. Han & Z. Wang. 2013. Life cycle comparison of hydrothermal liquefaction and lipid extraction pathways to renewable diesel from algae. Mitigation and Adaptation Strategies for Global Change 18: 137-158. Fukuzawa, H., S. Fujiwara, Y. Yamamoto, M.L. Dionisio-Sese & S. Miyachi. 1990. cDNA cloning, sequence, and expression of carbonic anhydrase in Chlamydomonas reinhardtii: regulation by environmental CO2 concentration. Proceedings of the National Academy of Sciences of the United States of America 87: 4383-4387. Geoffroy, L., H. Teisseire, M. Couderchet & G. Vernet. 2002. Effect of oxyfluorfen and diuron alone and in mixture on antioxidative enzymes of Scenedesmus obliquus. Pesticide Biochemistry and Physiology 72: 178-185. Gerard, V.A. & T. Driscoll. 1996. A spectrophotometric assay for RuBisCO activity: applications to the kelp Laminaria saccharina and implications for radiometric assays. Journal of Phycology 32: 880-884. Gerwick, W.H., M.A. Roberts, A. Vulpanovici & D.L. Ballantine. 1999. Biogenesis and biological function of marine algal oxylipins In: S. Nigam & C.R. Pace-Asciak. Eds. Lypoxigenases and their metabolites. Plenum Press, New York, pp. 211-218. Gimpel, J.A., V. Henríquez & S.P. Mayfield. 2015. In metabolic engineering of eukaryotic microalgae: Potential and challenges come with great diversity. Frontiers in Microbiology 2015(6): 1376. Graham, L., J. Graham & L. Wilcox. 2009. Algae. Pearson Benjamin Cummings, San Francisco. Graves, L.B. Jr., & W.M. Becker. 1974. Beta-oxidation in glyoxysomes from Euglena. The Journal of Eukaryotic Microbiology 21: 771-774. Groisillier, A., Z. Shao, G. Michel, S. Goulitquer, P. Bonin, S. Krahulec, B. Nidetzky, D. Duan, C. Boyen & T. Tonon. 2014. Mannitol metabolism in brown algae involves a new phosphatase family. Journal of Experimental Botany 65: 559-570. Gupta, V., S. Gaind, P. Kumar, N. Sood & A. Kumar. 2010. Purification and characterization of intracellular nitrilases from Rhodococcus sp.- potential role of periplasmic nitrilase. African Journal of Microbiology Research 4: 1148-1153. Gurbuz, F., H. Ciftci & A. Akcil A. 2009. Biodegradation of cyanide containing effluents by Scenedesmus obliquus. Journal of Hazardous Materials 162: 74-79. Gurbuz, F., H. Ciftci, A. Akcil, & A.G. Karahan. 2004. Microbial detoxification of cyanide solutions: a new biotechnological approach using algae. Hydrometallurgy 72: 167-176. Gutekunst, K., D. Hoffmann, M. Lommer, M. Eggert, I. Susuki, R. Schulz-Friedrich & J. Appel. 2006. Metal dependence and intracellular regulation of the bidirectional NiFe-hydrogenase in Synechocystis sp. PCC 6803. International Journal of Hydrogen Energy. 31: 1452-1459. Hall, L.M., K.B. Taylor & D.D. Jones. 1993. Expression of a foreign gene in Chlamydomonas reinhardtii. Gene 124: 75-81. Hallmann, A. 2007. Algal Transgenics and Biotechnology. Transgenic Plant Journal 1: 81-98. Hernández, I., F.X. Niell & J.A. Fernández. 1994. Alkaline phosphatase activity in marine macrophytes. Study of its localization in some widespread species in the southern Spain. Marine Biology 120: 501-509. Hernández, I., F.X. Niell & B.A. Whitton. 2002. Phosphatase activity of benthic marine algae. An overview. Journal of Applied Phycology 14: 475-487. Hoek, C. van den, D.G. Mann & H.M. Jahns. 1995. Algae: An introduction to phycology. Cambridge University Press. Cambridge. Iwamoto, K. & Y. Shiraiwa. 2005. Salt-regulated mannitol metabolism in algae. Marine Biotechnology 7: 407-415. Kaiser, W. 1976. The effect of hydrogen peroxide on CO2 fixation of isolated intact chloroplast. Biochimica et Biophysica Acta. 440: 476-482. Kobori, M., M. Yoshida, M. Ohnishi-Kameyama & H. Shinmoto. 2007. Ergosterol peroxide from an edible mushroom suppresses inflammatory responses in RAW264.7 macrophages and growth of HT29 colon adenocarcinoma cells. British Journal of Pharmacology 150: 209-219. Kuchitsu, K., M. Tsuzuki & S. Miyachi. 1991. Polypeptide composition and enzyme activities of the pyrenoid and its regulation by CO2 concentration in unicellular green algae. Canadian Journal of Botany 69: 1062-1069. Kumar, S.C., R.W. Misqitta, V.S. Reddy, B.J. Rao & M.V. Rajam. 2004. Genetic transformation of the green alga Chlamydomonas reinhardtii by Agrobacterium tumefaciens. Plant Science 166: 731-738. Kursula, P., J. Ojala, A.M. Lambeir & R.K. Wierenga. 2002. The catalytic cycle of biosynthetic thiolase: a conformational journey of an acetyl group through four binding modes and two oxyanion holes. Biochemistry 41: 15543-15556. Leftley, J.W. & P.J. Syrett. 1973. Urease and ATP: Urea amidolyase activity in unicellular algae. Journal of General Microbiology. 77: 109-115. Libertador, P., J. Anderson, M. Feiglin, M. Sardana, P. Griffin, D. Schmatz & R.W Myers. 1998. Molecular cloning and functional expression of mannitol-1-phosphatase from the apicomplexan parasite Eimeria tenella. Journal of Biological Chemistry 273: 4237-4244. Litchman, E. & B.L.V. Nguyen. 2008. Alkaline phosphatase activity as a function of internal phosphorous concentration in freshwater phytoplankton. Journal of Phycology 44: 1379-1383. Lohr, M., J. Schwender & J.E.W. Polle. 2012. Isoprenoid biosynthesis in eukaryotic phototrophs: a spotlight on algae. Plant Science 185-186: 9-22. Lopes, G., C. Sousa, P. Valentão & P.B. Andrade. 2013. Sterols in algae and health. In: B. Hernández-Ledesma & M. Herrero. Eds. Bioactive compounds from marine foods: Plant and animal sources. John Wiley and Sons, Chichester, pp: 173-191. Masukawa, H., H. Sakurai, R.P. Hausinger & K. Inoue. 2014. Sustained photobiological hydrogen production in the presence N2 by nitrogenase mutants of the heterocyst-forming cyanobacterium Anabaena. International Journal of Hydrogen Energy. 39: 19444-19451. Megías, M., R. Rivilla, J.M. Soto, M.J. Delgado, E. González, P.F. Mateos, M. León, B. Rodelas & E. Bedmar. 2011. Fundamentos y aplicaciones agroambientales de las interacciones beneficiosas plantas-microorganismos. Sociedad Española de Fijación del nitrógeno, Granada. Michinaka, Y., T. Shimauchi, T. Aki, T. Nakajima, S. Kawamoto, S. Shigeta, O. Suzuki & K. Ono. 2003. Extracellular secretion of free fatty acids by disruption of a fatty acyl-CoA synthetase gene in Saccharomyces cerevisiae. Journal of Bioscience and Bioengineering 95: 435-440. Miller, M.B., B.A. Haubrich, Q. Wang, W.J. Snell & W.D. Nes. 2012. Evolutionarily conserved δ25(27)-olefin ergosterol biosynthesis pathway in the alga Chlamydomonas reinhardtii. Journal of Lipid Research 53: 1636-1645. Msanne, J., D. Xu, A.R. Konda, J.A. Casas-Mollano, T. Awada, E.B. Cahoon & H. Cerutti. 2012. Metabolic and gene expression changes triggered by nitrogen deprivation in the photoautotrophically grown microalgae Chlamydomonas reinhardii and Coccomyxa sp. C-169. Phytochemistry 75: 50-59. Muñoz-Crego, A. & A. López-Cruz. 1992. Drogas del mar: sustancias biomédicas de algas marinas. Universidad de Santiago de Compostela, Santiago de Compostela. Ojumu, T.V. & B.O. Solomon. 2004. Production of polyhydroxyalkanoates, a bacterial biodegradable polymer. African Journal of Biotechnology 3: 18-24. Pearce, J. & N.G. Carr. 1967. The metabolism of acetate by the blue-green algae, Anabaena variabilis and Anacystis nidulans. Journal of General Microbiology 49: 301-313. Peers, G., T.B. Truong, E. Ostendorf, A. Busch, D. Elrad, A.R. Grossman, M. Hippler & K.K. Niyogi. 2009. An ancient light-harvesting protein is critical for the regulation of algal photosynthesis. Nature 462: 511-521. Piotrowski, M. 2008. Primary or secondary? Versatile nitrilases in plant metabolism. Phytochemistry 69: 2655-2667. Purton, S., J. Szaub, T. Wannathong, R. Young & C. Economou. 2013. Genetic engineering of algal chloroplasts: progress and prospects. Russian Journal of Plant Physiology 60: 491-499. Radakovits, R., R.E. Jinkerson, A. Darzins & M.C. Posewitz. 2010. Genetic engineering of algae for enhanced biofuel production. Eukaryotic cell 9: 486-501. Ramluckan, K., K.G. Moodley & F. Bux. 2014. An evaluation of the efficacy of using selected solvents for the extraction of lipids from algal biomass by the soxhlet extraction method. Fuel 116: 103-108. Reed, R.H., I.R. Davison, J.A. Chudek & R. Foster. 1985. The osmotic role of mannitol in the Phaeophyta: an appraisal. Phycologia 24: 35-47. Reiße, S., D. Garbe & T. Brück. 2014. Meiothermus ruber thiolase – A new process stable enzyme for improved butanol synthesis. Biochemie 103: 16-22. Romero, D.M., M.C. Ríos de Molina & A.B. Juárez. 2011. Oxidative stress induced by a commercial glyphosate formulation in a tolerant strain of Chlorella kessleri. Ecotoxicology and Environmental Safety 74: 741-747. Rothlisberger-Lewis, K.L., J.L. Foster & F.M. Hons. 2016. Soil carbon and nitrogen dynamics as affected by lipid-extracted algae application. Geoderma 262: 140-146. Samori, C., D. López, R. Vet, L. Pezzolesi, D.W.F. Brilman, P. Galletti & E. Tagliavini. 2012. Effective lipid extraction from algae cultures using switchable solvents. Green Chemistry 15: 353-356. Saxena, R.K., R. Gupta, S. Saxena & S. Gulati. 2001. Role of fungal enzymes in food processing. Applied Mycology and Biotechnology 1: 353-386. Schnitzler, I., G. Pohnert, M. Hay & W. Boland. 2001. Chemical defense of brown algae (Dictyopteris spp.) against the herbivorous amphipod Ampithoe longimana. Oecologia 126: 515-521. Scholtz, M.J., M.R. Riley & J.L. Cuello. 2013. Acid hydrolysis and fermentation of microalgal starches to ethanol by the yeast Saccharomyces cerevisiae. Biomass and Bioenergy 48: 59-65. Schroda, M., D. Bloker & D.F. Beck. 2000. The HSP70A promoter as a tool for the improvement expression of transgens in Chlamydomonas. The Plant Journal 31: 445-455. Servouse, M. & F. Karst. 1986. Regulation of early enzymes of ergosterol biosynthesis in Saccharomyces cerevisiae. Biochemical Journal 240: 541-547. Simó, R. 2001. Production of atmospheric sulfur by oceanic plankton: biogeochemical, ecological and evolutionary links. Trends in Ecology & Evolution 16: 287-294. Shaltiel-Karyo, R., M. Frenkel-Pinter, E. Rockenstein, C. Patrick, M. Levy-Sakin, A. Schiller, N. Egoz-Matia, E. Masliah, D. Segal & E. Gazit. 2013. A blood-brain barrier (BBB) disrupter is also a potent α-synuclein (α-syn) aggregation inhibitor: a novel dual mechanism of mannitol for the treatment of Parkinson disease (PD). Journal of Biological Chemistry 288: 17579-17588. Shawkat, H., W. Westwood & A. Mortimer. 2012. Mannitol: a review of its clinical uses. Continuing education in anaesthesia, critical care & pain 12: 82-85. Singh, S.P. & P. Singh. 2014. Effect of CO2 concentration on algal growth: A review. Renewable and Sustainable Energy Reviews 38: 172-179. Singh, S.P. & P. Singh. 2015. Effect of temperature and light on the growth of algae species: A review. Renewable and Sustainable Energy Reviews 50: 431-444. Smith, A.J, J. London & R.Y. Stanier. 1967. Biochemical basis of obligate autotrophy in blue-green algae and Thiobacilli. Journal of Bacteriology 94: 972-983. Sohoni, S.V., D. Nelapati, S. Sathe, V. Javadekar-Subhedar, R.P. Gaikaiwari & P.P. Wangikar. 2015. Optimization of high cell density fermentation process for recombinant nitrilase production in E. coli. Bioresource Technology 188: 202-208. Soto, G., M. Stritzler, C. Lisi, K. Alleva, M.E. Pagano, F. Ardila, M. Mozzicafreddo, M. Cuccioloni, M. Angeletti & N.D. Ayub. 2011. Acetoacetyl-CoA thiolase regulates the mevalonate pathway during abiotic stress adaptation. Journal of Experimental Botany 62: 5699-5711. Soto-Urzúa, L. & B.E. Baca. 2001. Mecanismos de protección de la nitrogenasa a la inactivación por oxígeno. Revista Latinoamericana de Microbiología 43: 37-49. Speranza, L.G., A. Ingram & G.A. Leeke. 2015. Assessment of algae biodiesel viability based on the area requirement in the European Union, United States and Brazil. Renewable Energy 78: 406-417. Staack, H., J.F. Binstock & H. Schulz. 1978. Purification and properties of a pig heart thiolase with broad chain length specificity and comparison of thiolases from pig heart and Escherichia coli. Journal of Biological Chemistry 253: 1827-1831. Stefels, J. 2000. Physiological aspects of the production and conversion of DMSP in marine algae and higher plants. Journal of Sea Research 43: 183-197. Subhadra, B.G. & M. Edwards. 2011. Coproduct market analysis and water footprint of simulated commercial algal biorefineries. Applied Energy 88: 3515-3523. Takeda, T., A. Yokota & S. Shigeoka. 1995. Resistance of photosynthesis to hydrogen peroxide in algae. Plant and Cell Physiology 36: 1089-1095. Tang, D.K., S.Y. Qiao & M. Wu. 1995. Insertion mutagenesis of Chlamydomonas reinhadtii by electroporation and heterologous DNA. Biochemistry and Molecular Biology International 36: 1025-1035. Tekaya, N., O. Saiapina, H. Ben Ouada, F. Lagarde, H. Ben Ouada & N. Jaffrezic-Renault. 2013. Ultra-sensitive conductometric detection of heavy metals based on inhibition of alkaline phosphatase activity from Arthrospira platensis. Bioelectrochemistry 90: 24-29. Thies, F., T. Backhous, B. Bossmann & L.H. Grimme. 1996. Xenobiotic biotransformation in unicellular green algae. Involvement of cytochrome P450 in the activation and selectivity of the pyridazinone pro-herbicide metflurazon. Plant Physiology 112: 361-370. Tippmann, S., Y. Chen, V. Siewers & J. Nielsen. 2013. From flavors and pharmaceuticals to advance biofuels: production of isoprenoids in Saccharomyces cerevisiae. Biotechnology Journal 8: 1435-1444. Trivedi, J., M. Aila, D.P. Bangwal, S. Kaul & M.O. Garg. 2015. Algae based biorefinery – How to make sense? Renewable and Sustainable Energy Reviews 47: 295-307. Ubando, A., A. B. Culaba, R. Tan & D. K. S. Ng. 2012. A systematic approach for optimization of an algal biorefinery using fuzzy linear programming. In: I.A. Karimi & R. Srinivasan. Eds. Procedings of the 11th International Symposium on process systems engineering, 2012, Elsevier, Singapore, pp. 805-809. Vignais, P.M., B. Billoud & J. Meyer. 2001. Classification and phylogeny of hydrogenases. FEMS Microbiology Reviews 25: 455-501. Walker, T.L., C. Collet & S. Purton. 2005. Algal transgenics in the genomic era. Journal of Phycology 41: 1077-1093. Weber, H. 2002. Fatty acid-derived signals in plants. Trends in Plant Science 7: 217-224. Whitton, B.A. & M. Potts. 2012. Introduction to cyanobacteria. In: B.A. Witton. Ed. The Ecology of Cyanobacteria II: Their diversity in time and space. Springer, Dordrecht, pp. 1-13. Winkler, M., A. Hemschemeier, C. Gotor, A. Melis & T. Happe. 2002. [Fe]-hydrogenases in green algae: photo-fermentation and hydrogen evolution under sulfur deprivation. International Journal of Hydrogen Energy 27: 1431-1439. Winkler, U., W. Säftel & H. Stabenau. 1988. β-Oxidation of fatty acids in algae: Localization of thiolase and acyl-CoA oxidizing enzymes in three different organisms. Planta. 175: 91-98. Zabawinski, C.N., C. van den Koornhuyse, R. D’Hulst, C. Schlichting, B. Giersch, J.-M. Delrue, J. Lacroix, J. Preiss & S. Ball. 2001. Starchless mutants of Chlamydomonas reinhardtii lack the small subunit of a heterotetrameric ADP-glucose pyrophosphorylase. Journal of Bacteriology 183:1069–1077. Zajic, J.E. 1970. Properties and products of algae. Plenum Press, New York. Zhang, L., B. Yin, C. Wang, S. Jiang, H. Wang, Y.A. Yuan & D. Wei. 2014a. Structural insights into enzymatic activity and substrate specificity determination by a single amino acid in nitrilase from Syechocystis sp. PCC6803. Journal of Structural Biology 188: 93-101. Revisoras: Angélica López M., Claudia Segal K. y Yolanda Freile P.